What is really exciting about our new partnership with Percy Warner Parks Nature Center is the heightened interest by faculty in learning about our natural world. Tomorrow we will take a "field trip" to our garden and students will each select something special to observe in old fashioned naturalist tradition. They will be carefully drawing what they observe, framing their observations and questions, learning how to think like a scientist. They will model on the great naturalists from the past. I hope to get some of our kids and teachers to read - The Evolution of Calpurnia Tate. It's the perfect book to set young students on the path to be naturalists. 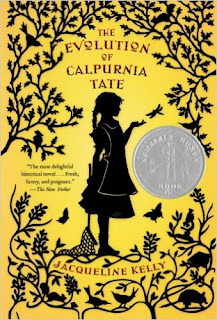 Calpernia is a young girl at the turn of the last century whose curiosity leads her to be a naturalist in a time when girls rarely did these things. Her relationship deepens with her grandfather who opens this wonderful world to her as she struggles against the traces of being a girl in a boys world. While those themes may dominate in some readers minds, the beauty of this book for me is that it gives children today, not only a glimpse of life in a different time, but also gives them a glimpse of how they might look at the real world at this moment! 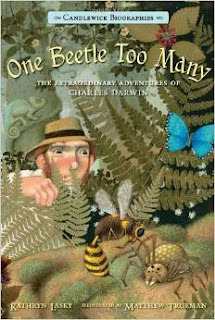 Another book that helps students see the world and how interacting with it can change us is One Beetle too many! If for no other reason than its author, Kathryn Lasky, it is worth reading. Lasky never misses an opportunity to help kids gain insight into what motivates people. She carries us along as we see how Charles disappoints his Dad, but remains true to what is stimulating his curiosity. Why are there sea shells on mountain tops? What makes plants and animals of the same species so different in different parts of the world? The book is a mixed-media treasure trove for kids to explore. influential at a time when other naturalists were beginning to frame the idea of preserving land for its own sake. This book is full of stories from his childhood that lead him into the path that changed our understanding of the wilderness. I will be starting a Young Naturalist's book club afterschool soon, and I invite you to follow our exploits, journaling, as we inspire our students to love this precious planet. 1st graders harvest what they planted and roast the veggies! 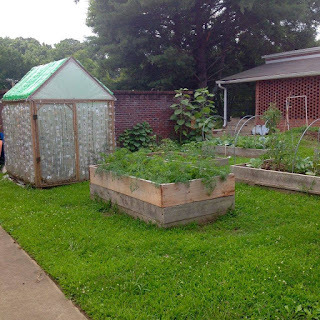 Since 2008, when we first started the school garden, I have been on a deepening path of trying to live out my principles relating to conserving and leading a healthy life. As early the 70's it was clear that fundamental change to our consumption patterns was necessary. After Reagan became president I gave up on changing things. 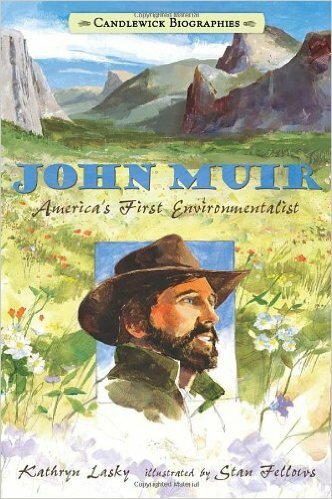 His strong opposition to government regulation rendered large swaths of environmental legislation impotent. (This is not a republican/democrat issue - EPA and the Clean Air Act were Nixonian--remember) I couldn't even teach about Earth Day in the public schools. To do so brought accusatory phone calls from parents who believed that mentioning it was teaching a communistic world view. There was no reasoning with these folk that planting seeds, growing food, or using less plastic was a simple recognition that resources are finite. No matter how I talked about these issues I could not convince these parents that teaching about this was an act of patriotism. Read how school gardens make strong minds and healthy bodies! When we began the garden it was mostly about student health, food security and healthy outdoor life-long activity. When over time, I saw the soil go from being dusty, dead dirt to being an exciting living community of organisms. I realized that I did not need commercial fertilizer if I used composted cafeteria waste to enrich it each season, nor did I need to use herbicides or pesticides if I was careful about complimentary planting and weeding. So we became an organic garden. Memories flooded back from childhood in the garden with my parents and grandparents, in thickets on Sunday afternoons by the side of the road, walking down the canes and getting scratched up as we picked the plump sun ripened berries that soon became cobbler with home made ice cream melting on top! These berries were part of a common wealth growing as they were in hedgerows and bar ditches! I got to know other people who were also on this path, and together with Chef Martha Stamps, a leader in the slow food movement here in Nashville, we spent an hour a week becoming more aware of the many perspectives about the importance of local, fresh food to our health and well being. We learned about agribusiness and how our food was being grown and transported around the world with HUGE carbon impacts. We learned about how animals were being raised, slaughtered and processed with the huge polluting of watersheds. We learned about overfishing, the acidification of the oceans, and the added pollution by farmed seafood and the impact of plastic waste aggregating there! I was stunned to see animals bred so that they could not even support their own weight and were contained for the entire short miserable lives in metal crates. Knowledge is a terrible thing. As a Christian I was well aware of the scripture from Hebrews 10:26 "Dear friends, if we deliberately continue sinning after we have received knowledge of the truth, there is no longer any sacrifice that will cover these sins." It became critical for me to find local farmers who raised their own animals humanely without hormones and antibiotics, who raised their vegetables without pesticides, herbicides, and artificial fertilizers. These things cost far more than the heavily subsidized agribusiness of Smithfield or Hormel, but I chose to pay these prices and found myself wasting far less food and eating less meat. I learned from these farmers and the food that I put on my plate took on a new meaning. By now, I believed that there would be no movement on the major issues relating to these issues, but as for me, I was going to live out my deeper understanding in as much as possible. 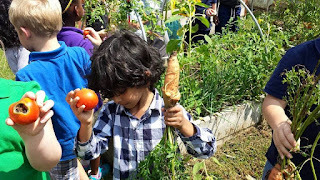 I was committed to help children learn to taste the difference between the food they bought at the grocery store and what was grown in the garden. I learned that they will eat and enjoy tasty vegetables especially if they help grow them! We made spinach salad, roasted vegetables, and fried green tomatoes. The children helped cook in the library, and declared everything to be tasty! I knew I was on the right track last spring when I saw a flock of children descend on the garden and eat (unwashed mind you) pea pods filled with sweet English peas. In 2009 children would regularly say, "EWE that has dirt on it" and sometimes they didn't want to eat it even after washing it (the vegetables in the store afterall are shiny with wax and packaged in wrap)! So where do we go from here? I'm open to suggestions.